HomeCryptoBitcoin NewsBitcoin: where to next? Bitcoin’s price has been relatively uneventful over the past few weeks. 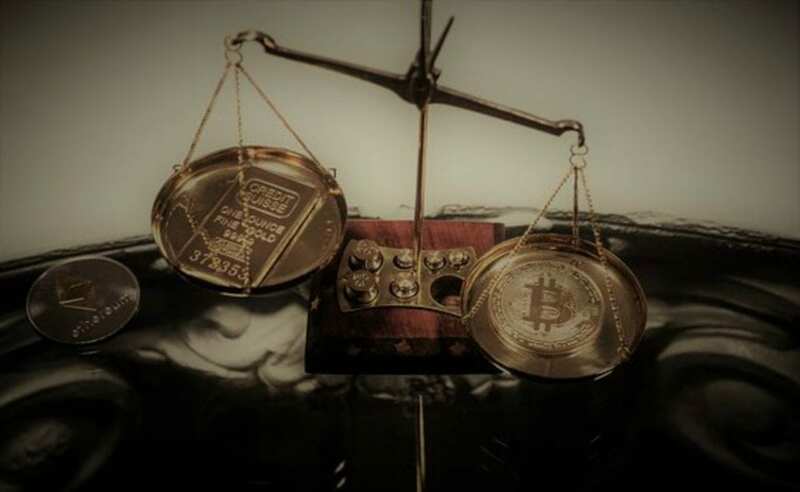 As an overall indicator of market sentiment and health, bitcoin seemingly still shows indecision, hanging in the balance between two opposite price directions. As seen in the Bitstamp bitcoin daily chart, the fall of 2018 saw a significant dry spell in terms of volatility. That period of consolidation in the $6,000 range eventually led to an explosive move to the downside. Bitcoin’s dramatic drop in price seemed to coincide with the bitcoin cash (BCH) fork – an event that split the BCH community in two. The past several weeks appear similar to last fall in regards to bitcoin’s lack of price volatility. Volume also seems to have declined – however, it currently doesn’t look as low as last fall’s consolidation period. Looking at bitcoin’s 4-hour price chart, it seems as though stop-loss runs (long wicks stopping out orders) are becoming more infrequent with less severity. One possible scenario might see bitcoin pulling an inverse “Bart Simpson pattern” upward, near the $3,450 level. Although the absence of such patterns lately seems to lessen the likelihood of such an event occurring right now. As usual, Twitter and YouTube host no shortage of opinions on the state of the crypto market. One of the big arguments right now is the question: has bitcoin’s price (and subsequently the market) found a price bottom? Analyst and trader Bob Loukas made a good point in a Tweet today on the state of bitcoin’s trading volume, or lack thereof, implying that the cryptocurrency might be heading for a bold move. #bitcoin exchange volume has dried up completely while price tightens. That's a reason to brace, not be getting long. #cryptotwitter still seems fixated on trying to time a bottom or get long here. 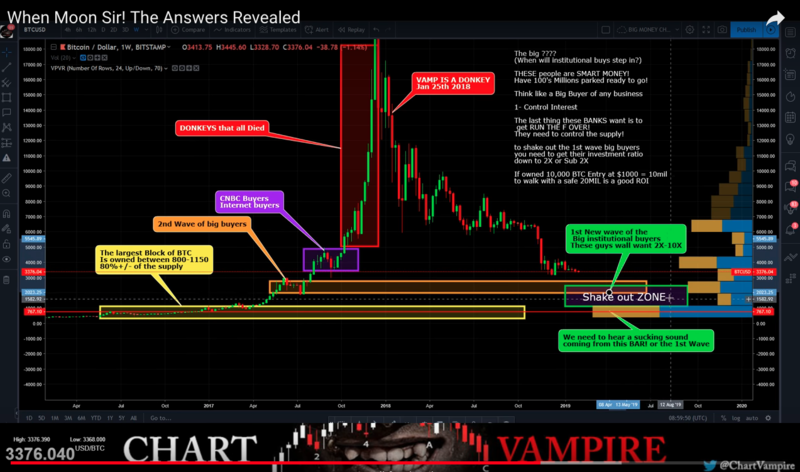 On the YouTube front, in his February 7 video, technical analyst Chart Vampire looked at several factors possibly impacting different price levels for bitcoin. Vampire noted his speculations on where big players may have bought into bitcoin and where they might sell, as well as which levels they may be waiting for. He concluded, based on his opinions and analysis, that institutional buyers may be waiting for bitcoin’s price to drop somewhere inside the $1500-2500 range before buying in. Alternatively, however, Rob Paone, host of CryptoBobby YouTube, released a video yesterday looking at the situation from a different angle. In the video, Paone interviewed influencer Ethan Ackerman. Throughout the discussion, the pair of influencers talked about sentiment in the crypto space, and how different aspects might impact the market going forward. This view also lines up with a recent article from Crypto Insider, which noted a lack of price action surrounding significant news events. One such example included the lack of volatility seen after CBOE pulled its bitcoin exchange-traded fund (ETF) application regarding the VanEck-SolidX bitcoin ETF. Based on Ackerman’s comments in the interview, he takes many different factors into account when speculating on price action. He mentioned weighing Twitter sentiment in particular. Back when bitcoin was falling, did you think that $6,000 or $3,000 was the low? Because I remember a lot of people saying, at least in passing, that ok, we could hit $3,000. I wasn’t seeing anything for $1,000. But now that we’re actually at $3,000, I’m seeing alot of people just completely shift their positions down – $2,000, $1000 – or below, just because price is now at $3,000″. Ackerman did, however, note that many situations do require a change in opinion and subsequent adjustment according to price action and levels. Ackerman explained his thoughts and methodology regarding the situation in much further detail in the interview. One thing is certain: time will tell, regarding the future of bitcoin’s price. *This article is based on opinions and speculations from the author and others, and is not in any way financial advice. Writing about price levels is purely speculation, subject to speculatory bias. Nothing written is any kind of advice whatsoever. Proceed only at your own risk.